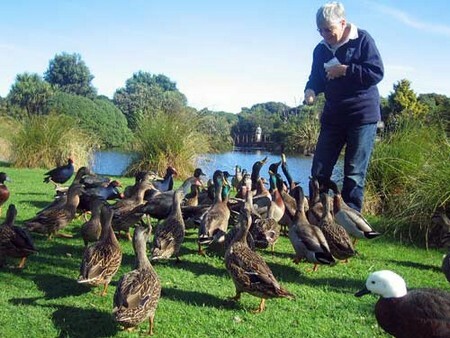 Taking children to the local city park to feed the ducks bread is a tradition for many families. You fed ducks as a child and your parents probably did as well. But did you know that this tradition of feeding ducks bread actually causes ducks to be harmed? Bread is not a natural food source for any duck. In city parks where ducks may get much of their food as handouts, the ducks are severely malnourished. They suffer from bone deformities and over all poor health. Look around at the duck pond next time, how many ducks do you see that are limping, have beak deformities or other obvious health issues. The main cause is their diet of bread. You probably enjoy spending time with the ducks and seeing your children interact with them because you care about animals and wildlife. So the next time you visit the ducks bring some better food choices that will improve their overall health. First, make sure it is legal to feed them. Many places have banned the feeding of waterfowl, as it has created health problems for both the birds and for humans, as well as creating very aggressive birds. If it is legal to feed them, get some cracked corn or duck food from a farm store. NEVER feed them bread! Although Ducks seem to love bread, it is not nutritious. White bread in particular is made from refined flour and is not proper for avian nutrition. Many Ducks suffer from degenerative liver disease because they eat too much. Also, leftover bread and Duck droppings pollute the water. The uneaten bread turns into a deadly mold called Aspergillus, which is fatal to Ducks, fish and other animals. Rotting bread can also breed other deadly diseases and parasites, particularly a Duck virus Enteritis, which with a single outbreak will kill all the Ducks of that area. Duck droppings can also breed diseases such as Avian Botulism and a parasite that causes swimmers itch. Feeding Ducks bread is like feeding Dogs chocolate. They may seem to like it but in the end it does more harm than good. Bring a bag of frozen peas to toss into the water. Feed pellet duck food. Feed stores and some online retailers sell pellet duck food. This is a nutritionally complete food made just for ducks. If your children want to feed the ducks, be sure to supervise. I heard that some ducks can be aggressive and attack the feeders. I never personally experience this, but being careful is good.